Medium Bird Toys for Cockatiel and Conure Size Birds "Sophomore"
You can rest assured your Cockatiel, Conure, Senegal, Quaker and all similar size birds will have a great time with their FunTime Birdy Bird Toys because they are hand made right here in the U.S.A. and we only use the safest bird safe materials. 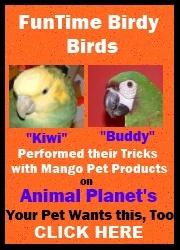 Bird playtime is a very important factor to the well being of your bird. If your bird is afraid of bird toys or if your bird is the bird toy King or Queen.....FunTime Birdy has the right bird toy for your feathered friend. FunTime Birdy Bird Toys...Bird toys your bird will love, price and quality you will adore.